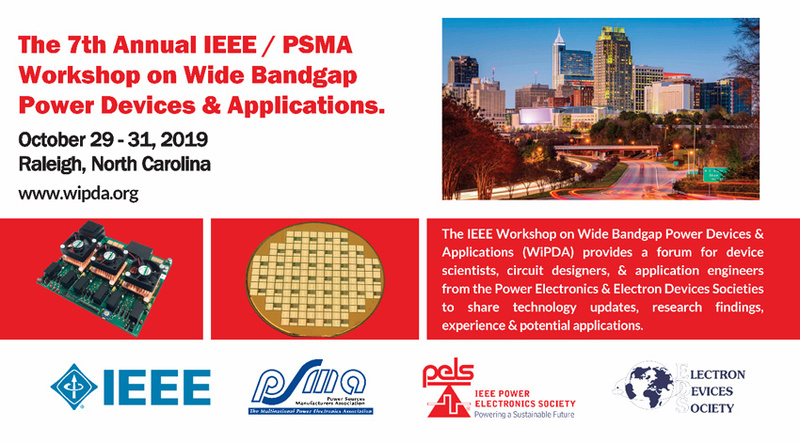 he 7th Annual IEEE / PMSA Workshop on Wide Bandgap Power Devices and Applications (WiPDA) [www.wipda.org ] will be held in Raleigh, North Carolina from October 29 to 31, 2019. This annual event provides engineers and scientists with opportunities to share their expertise in wide bandgap (WBG) semiconductor technology. This year's workshop features tutorials on October 29, 2019. The following two days will host keynote sessions, panel sessions, technical sessions, and a poster session that covers four technical tracks: silicon carbide (SiC) devices, SiC applications, gallium nitride (GaN) devices, and GaN applications. Topics in emerging WBG materials will also be solicited. There will be many opportunities to network with leading WBG specialists in industry and academia, especially at the Industry and Sponsors Exhibition, which occurs simultaneously with the workshop. A banquet is planned for October 30, 2019. The workshop is brought to you by the IEEE Power Electronics Society (PELS), the Power Sources Manufacturer's Association (PSMA), and the IEEE Electron Devices Society (EDS). The General Chair is Victor Veliadis, Chief Technical Officer and Deputy Executive Director of PowerAmerica and Professor of Electrical and Computer Engineering at North Carolina State University (NCSU). He is supported by Vice Chair Jin Wang, Co-Director for the Center for High Performance Power Electronics (CHPPE) and Professor of Electrical and Computer Engineering at The Ohio State University (OSU). June 14, 2019: Abstract submission deadline. July 19, 2019: Notification of the abstract. August 23, 2019: Paper submission deadline for workshop proceedings. The abstract submission portal will open mid spring to accept authors' manuscripts. Researchers are encouraged to submit their latest findings on fabrication of WBG power devices, their insertion in power electronics circuits/systems, and on technology of SiC, GaN, and other emerging, high performance WBG power semiconductors. Additionally, tutorial proposals will be solicited from experts that can provide in-depth discussions on WBG power semiconductor materials, devices, and their applications in power electronics, circuits and systems. We look forward to seeing you this fall in Raleigh, North Carolina, USA.